You can compare the performance of PureClarity against your existing website setup using this benchmark feature. In this way you can gain confidence that PureClarity is providing the uplift in conversions and revenue expected compared to your current setup. You first setup a benchmark test by determining the volume of traffic you want split between PureClarity and your existing website. Use the sliding campaign distribution bar to determine split percentages. For each BMZ you have defined you will need to make sure that it is populated with content by your existing site. 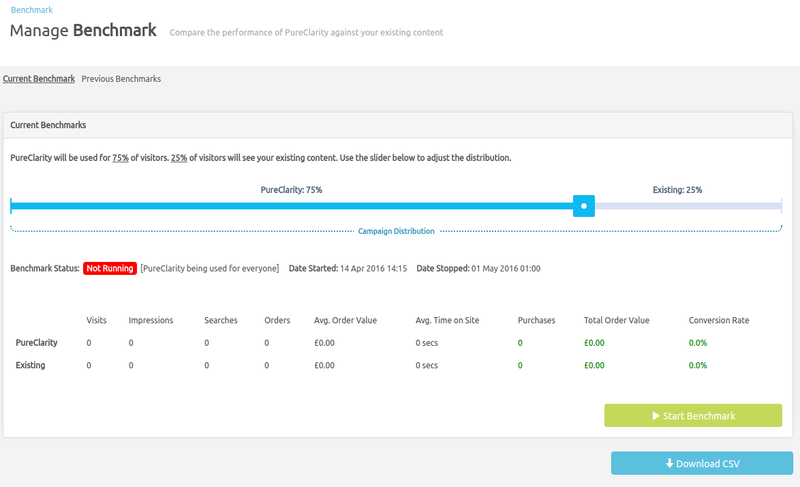 PureClarity, based on the distribution split, will then either render PureClarity content or allow your site to present its own content. To start the test click on the ‘Start Benchmark’ test. PureClarity will start to track traffic according to the split. You can see the result of the split test in the benchmark table. You cannot schedule a benchmark test, it can only be started and stopped manually in the admin console. Once a benchmark test is stopped the results will be stored under previous benchmark test so that you can compare results.